Yes, it really has been seven years since Mel Gibson was captured on celluloid in front of the camera. And while a world of filmgoers were tempted to write him off by failing to separate the actor from the man who made an offensive tirade after the arrest captured 'round the globe, once you see his cool, still gaze searing into the eyes of a man he assumes may have been involved in the death of his daughter, we realize just how much cinema has missed Gibson's onscreen presence. The man has an undeniable gift to blink on tears, get you right where it hurts and take you with him on the most tumultuous journeys which he does to brilliant effect in what I truly feel is one of the most underrated thrillers of 2010 thus far. A sleeper that will hopefully fare better on disc, if viewers can get past their prejudices, Casino Royale director Martin Campbell takes up the helm once again of the same saga he told over two decades ago in BBC's smash hit miniseries for Edge of Darkness. Having recently reviewed the original work earlier this year, I worried I'd be unable to remain objective when it came to this truncated 117 minute version of the much longer and far more complex whole. Luckily, I realized that unlike last year's State of Play which lost a lot in the translation from miniseries to film, Darkness has turned into a more determined study of a man on a singular mission to find out who was behind not just the trigger of the gun and bullet that killed his twenty-four year old daughter on his doortsep but the entire order to have her murdered in the first place. Erroneously assuming that his daughter was mistakenly executed in lieu of him, the Boston Homicide Detective Thomas Craven realizes soon thereafter that nothing that happened the night that the widowed man's daughter Emma returned home for a visit was accidental as shortly after getting ill a few times in a short span, instead of the emergency room, she wound up in the morgue. 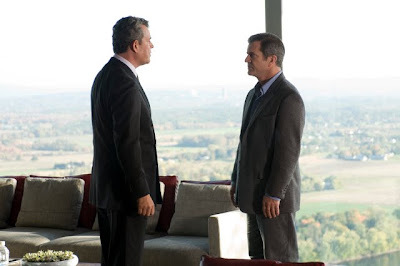 Going after her place of business – the private governmentally contracted research firm Northmoor – soon Gibson encounters the smiling but sleazy executive Jack Bennett (Danny Huston) who asks him how he felt after seeing his daughter gunned down before a man named Jedburgh (Ray Winstone) tells him they need to talk about who shot his daughter. Nearly stealing the film away from Gibson in the most charismatic role, Winstone's Jedburgh makes an ironic change from the original version as Joe Don Baker's initial characterization was the only American written into the script whereas this time around, Winstone plays the only British individual in the city of Boston. Co-written by The Departed's William Monahan who knows Boston's cops and robbers better than anyone working in Hollywood right now, the film manages to overcome its Charles Bronson set-up as Gibson's Craven vows to kill anyone responsible for the death of the only loved one he had left in the world as Edge of Darkness takes a rather intelligent turn bringing conspiracy theory and politics into the mix. While anyone familiar with the original miniseries knows where the film is ultimately headed, it gets there with far more action ready precision this time around as the movie becomes a nearly Dennis Lehane imbued version of a western, with us wondering just who will be the last man standing in a parade of liars and crooks. Brilliantly executed, while the safe route is to lump this film together with last year's Taken or even Gibson's old Ron Howard film Ransom, this vengeance fueled saga is more film noir than James Bond and frequent Bond director Campbell knows it all to well, understanding that Gibson needed a quietness about him we haven't seen before. Anchored by yet another solid turn from Gibson whom we may have taken for granted in his bad publicity aftermath, Edge of Darkness is a thriller with heart and mind that's definitely worth capturing on crisp, impressive Blu-ray as we're led through a bevy of topical featurettes that give you a greater understanding and appreciation of the levels laced into this outstanding work.